Disclosure: This is a sponsored post for SheSpeaks/Febreze. It's time to leave your smelly car in the dust! It's time to ride in freshness with Febreze Car Vent Clips! Why is my car so smelly? Since my husband gets to drive our nice car to work, I'm usually running around in our old pickup truck. That old thing has seen much better days, and it's also the vehicle I use to take my dog to the vet. In the dead heat of summer, it's nearly rancid. Thank goodness for Febreze Car! I received this fun Febreze Car and had a blast opening up the hood! Inside I found a sheet of little bumper stickers for the Febreze car, sticker clings for my car, a 3-D car and a Febreze Road Trip board game. In the seats of the Febreze car were three "passengers" - Febreze Car vent clips in Gain Island Fresh, Linen and Sky, and Midnight Storm. Have you ever left a food bag in the car after running through a drive-through? Getting in the car a few hours later, the smell can be staggering. If you have kids, you're probably familiar with the choking smell of molded milk from a baby bottle that got dropped under the seat a few weeks ago. I remember getting into the truck a few years ago after I had taken the cats to the vet. One of them apparently didn't appreciate the truck ride very much and had peed on the seat in the back. Some days I think I can still smell that! I was more than excited to try Febreze Car in the truck! I stuck the Febreze Car Vent Air Freshener Clip to the vent and closed the door. It's so easy to use - just slide the clip onto an air vent slat. I went back about an hour later and every single smell in the truck was gone. I was amazed! 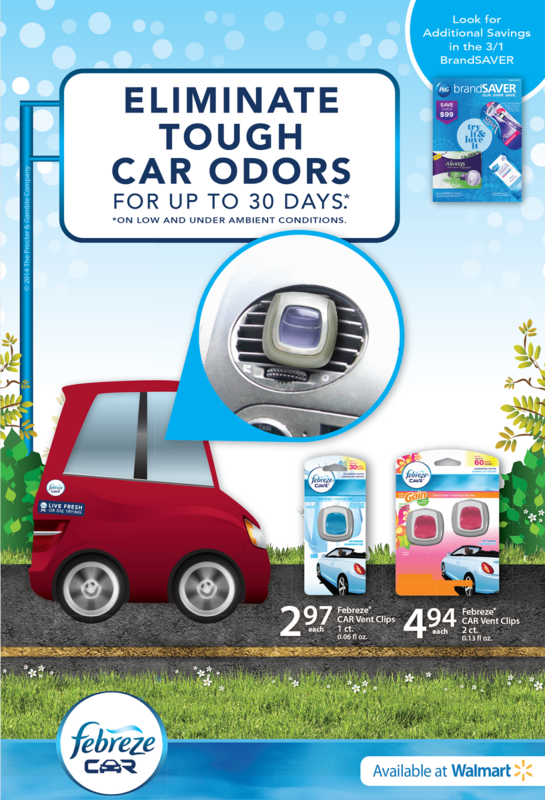 Febreze Car clips come in several scents and can be purchased in packs of one or two. I will also be putting one in the car my husband drives to work, so that it smells nice for me on the weekends when I get to take over the nicer vehicle. Each one keeps cars fresh for up to 30 days! Backseat passengers love freshness too -- just attach a Febreze Vent Clip to the passenger vent. 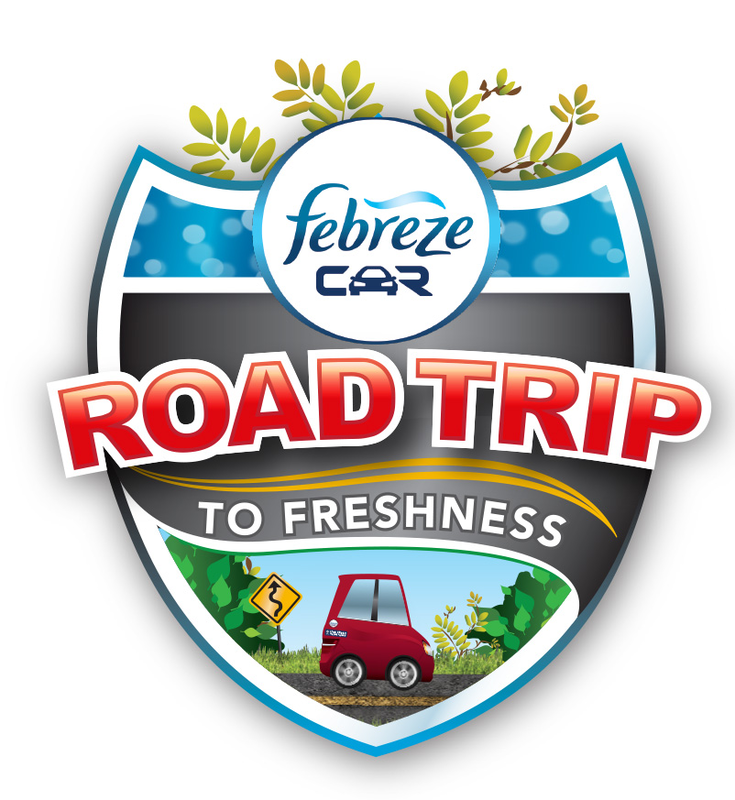 Find Febreze Vent Car Clips at your local Walmart and take freshness on the go! Look for the offer in the 3/1 Sunday brandSAVER to see how you can buy a single clip at Walmart and get another free! Febreze Vent Clips helps you take the comfort of a fresh-smelling home on the road. Win a $25 Walmart Gift Card to get Febreze Car Vent Clips! To enter, just fill in the contest form below. Open to US residents ages 18 and older. Giveaway closed on 3/18/2015. Good luck! My fiance's work truck is smelly! He is a painter and it smells really bad. What really stinks in my car is my dog and my brother's two dogs when we take them for a ride, especially in the Summer All the panting is smelly! I go to the gym quite often, if I don't have a towel or car cover, my sweat can make my car stink especially in the summer. What stinks in my car is leftover food and the smell of my dog! Mine and my husband's work out clothes make our car stink. Hockey gear stinks in my car. I'd forgotten how awful hockey gear stinks! My son played many years ago. Left over food wrappers and trash stinks in my car. My family members smoke and that's what stinks up my car. Cigarette smoke is what stinks in my car. My kids sports equipment stinks up my car! Pet's odor stinks in my car. My kids leftover food smells in the car. Hubby's workout clothes sometimes stink in the car. My sons when I pick them up from their sports. Wet towels stink after we go to the pool. When we eat fast food in the car, it stinks. My car just gets a musty smell from being closed up all winter. Cigarette smoke stinks in our cars. We are a one car family. My husband drives our car to and from work. He has a very stinky job and leaves icky lingering odors behind in the car! YUCK! Usually what's stinking is the kids food or food wrappers left in the car. Last week my car came back from the dealership with a gas smell. My dirty gym clothes and socks can really smell up my car. nothing really, only when my dog rides with me. The previous owners of our car smoked it in. That can be a bit stinky! If I take my dog someplace without first giving him a bath he can make my car stinky. I don't have any odor issues in my car. I use it for myself and don't eat in the car. I don't really have any smell issues in my car, but I do love the way the Febreeze clip makes it smell fresh! Cigarette odors can become intense! Nothing smells in the car. It is very clean. Cigarette smoke stinks in my car!! When I accidently leave a few groceries in the car. Nothing stinks in our car because we use Febreze car clips! Dog smell when I take them to the park or on road trips. My biggest smell is my son will run thru the drive thru and leave the bag of trash in the car! Drives me nuts! Rarely a snack bag gets left behind but usually one of the boys or the hubby farts in the car! Our dogs make my car stink! My dogs make the car stink! My car still carries the odor of spilled protein shake from several years ago. Not pretty. Pet odors linger in our car, because we like to take them for rides. Teenage boys after a sporting event-not nice! Visit FebrezeCar and leave a comment below, telling me what stinks in your car. Hubbys gym clothes and food my kids leave behind. I usually eat my lunch in my car, so there can be some smelly moments from that! My daughter's softball cleats are what causes my car to stink. They smell so bad. thank you!! I have been known to leave a dirty diaper in the van. Bleah! Yeah, I did that once or twice when mine were babies. My car usually stinks of stale air. Smelly socks stink in my car. I don't have a car but when I did, my man used to smoke and let his friends get in the car and they smelled like stale beer. Stale cigar smoke --- its hard to get that out. my husband has a habit of tossing food wrappers in hard to find places... after awhile they get "fragrant" I end up finding them but they leave a bad smell in my car. I will be so happy when he gets his own vehicle soon lol. I left some wet towels in my car that has left a lingering odor. My grandkids leave their old food wrappers in the back of my mini van and I don't find them until they start stinking. I don't have a car. But on the bus , if the driver is eating a smelly sandwhich, yuck!! My husbands baseball clothes left in the car stink! My car mat stinks. A few years ago someone spilled gas at the gas station and I tracked it in. I've cleaned it, aired it out and done everything I can think of. It still smells like a robot died in my car. My dog is smelly after spending the afternoon at the park. My son's work clothes when he forgets to bring them in the house. They are foul! My husband never cleans his car and it really smells bad sometimes. I am sure my car is stinky now because we haven't cleaned it in a while from food trash. I've been taking my husbands work car for gas mileage since he's had to use his truck lately. It smells like concrete whether he's been in it or not. I'd love to get rid of that stink! My car stinks when we order fast food. Fast food is what makes it the worst! My dog stinks up the car, he goes everywhere with us and I love him but he hasn't learned to shower everyday so the car smells like him. The cigarette smoke stinks in my car. We eat in the car sometimes or go to pick up pizza. Food smells are in my car. My sons hockey equipment stinks in my car. Fast food stinks up my car!! Left over fast food bags. Just sweat smell is the only odor problem we have but it is bad enough. Sweaty kids from being at the park running around. Peeww! On occasion, lingering smell of fast food. Sometimes wet towels or mud tracked into the car. My husband's cleats stink up the car. We're dealing with the lingering odors from take-out pizza, Chinese, and Indian in our car! In our truck, the person that had it before us smoked like a chimney. We have cleaned it and cleaned it, it still smells stale. Leftover food that falls between the seats smells awful. The ash tray, my hubby smokes! He's not allowed to smoke in the house, and won't be allowed to smoke in our new car. He really needs to stop smoking. food the kids leave in the car and socks from sports they leave in the car. The "empty" fast food wrappers my husband leaves in the car! Nothing in my car stinks. I don't leave trash in it. When my children leave their sweaty socks in the car, they stink it up! My dogs hair stinks in my car.